Eight of New Zealand's top super heavyweights go head to head under K-1 kickboxing 8 man elimination rules to find the country's King. 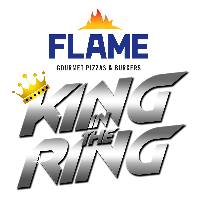 The first King in the Ring 8 man elimination event for 2018 is brought to you by Flame. The big boys are back, set to showcase their knockout power in a series of 3 round elimination bouts, to decide who is the New Zealand super heavyweight King in the Ring champion. Paulo 'The Barbarian' Lakai will not be returning to defend his crown, leaving the 8 contenders to battle it out for the title. Don't miss this New Zealand super heavyweight K-1 kickboxing action!